for pumping thin fluid media such as acids, alkalies and detergents (with polypropylene pump tube), highly aggressive chemicals (with PVDF pump tube), mineral oil products up to 1,000 mPas (with aluminium pump tube) or flammable media and food (with stainless steel 316Ti pump tube). Universal electric motors in 230, 115, 24 volts in different performance and protection classes. Air operated motors (for max. 6 bar operating pressure). Pump tubes made of polypropylene, PVDF, aluminum or stainless steel 1.4571. The JESSBERGER universal motors that can be combined with all pump tubes outside hazardous areas are lightweight, handy and powerful devices for nearly all thin fluid and slightly viscous media. The non-stationary and stationary applicable drum pump motors are particularly suitable for intermittent operation. 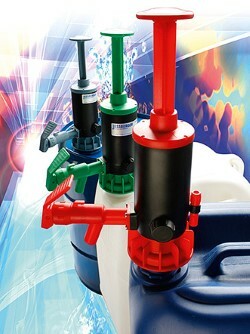 The sophisticated, technically clear structure of the drum pump ensures a rational and safe use. Quick disconnection of the drive from the pump tube through a few rotations enables the combination of an engine with various pump tubes for different media. Wide range of accessories such as drum and threaded adapters, media-resistant hoses, nozzles, wall hanger or flow meter are available on request. Easy disassembling and quick cleaning of the pump tubes. The speed of the drum pump motors can be controlled electronically via a knob on the handle. This enables an adjustment of the flow rate. For aggressive media such as acids, alkalies and detergents. For highly aggressive media such as chlorine bleach, chromic acid, hydrofluoric acid, nitric acid, sulfuric acid > 90%. For mineral oil products such as diesel, heating oil, hydraulic oils, gear oils, engine oils, mineral oils and motor oils up to 1,000 mPas. Please ask us regarding the chemical resistance. ► The flow rate of a drum pump depends initially on the speed of the motor and then on motor power. 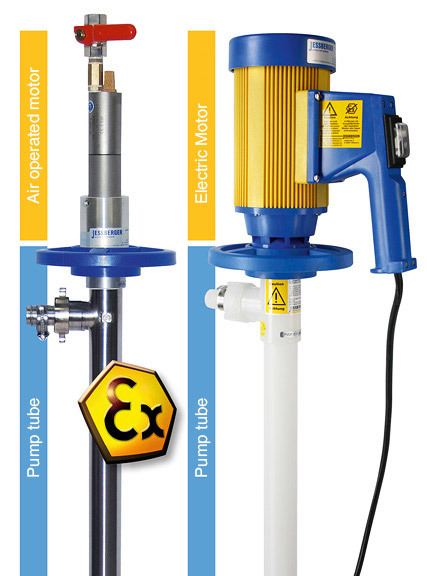 ► For flammable media and for use in hazardous environments explosion proof drum pumps with accessories are available. 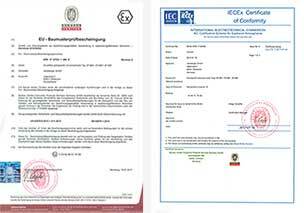 The electric and air operated engines and pump tubes of conductive stainless steel need an ATEX approval. When pumping flammable media a potential equalization is mandatory.